There is a very loose, slightly ironic, connection between these photos from two assignments I covered today. One was early in the morning down in Horn Lake, MS to cover the city’s participation in the Great American Clean-Up and made this photo of young Alex Freeze hauling a bag of trash that was practically as big as him. 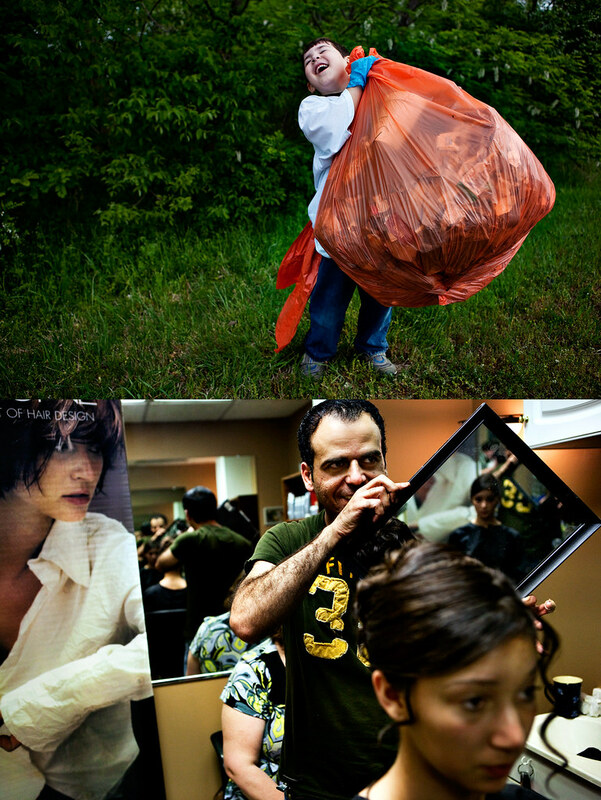 The second photo is for a business profile on hair stylist, Feras Hdaib, working on Jasmine Crew’s prom hair. As I am finishing up with Feras, he tries to get me to schedule my own hair cut. I politely and professional dodged the question, but in my mind I was saying “STAY AWAY FROM MY GLORIOUS MANE!” Then Feras runs out of the salon to hand me a coupon to give to my girlfriend for a 1/2 off first visit. So, if I don’t have a girlfriend, then didn’t Feras technically litter by giving me a coupon I won’t use since I will ultimately throw it away? I guess my day was garbage in and garbage out. That last shot is great. Every space in the photo is filled with another complete image that helps to tell the story. I have a hard time getting them lined up like that.